Derby History: Tried out for DYDD 18 March 2010 (2 weeks after returning from deployment to Iraq), drafted to Femme Fianna 12 January 2011, deployed to Afghanistan June 2014-started the IJC Roller Warriors a Recreational League in Afghanistan comprising of men and women from US and UK Forces. 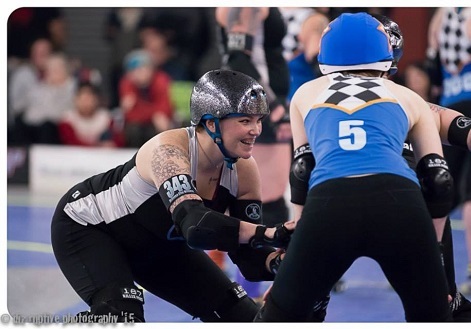 Joined the Brussels Derby Pixies in February 2012 and transferred to the Antwerp One Love Roller Dolls in July 2012. Returned to DYDD and the Femme Fianna in December 2012. 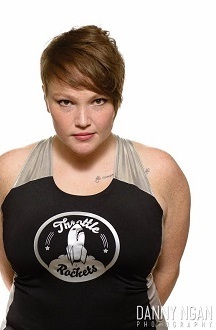 Tried out for Rat City Rollergirls 28 June 2013, drafted to Throttle Rockets 8 September 2013. Injuries: Dislocated left pinky-I have pictures-wanna see? Awards: MVP Rollergirls of the Apocalypse, Kaiserslaughtern Germany v. One Love Roller Dolls Antwerp Belgium September 2012. Rose City Derby Daze 2013 Best Name Ever.